Soak rice for 30 minutes. Add rice and Kausar Banaspati to boiling milk. Once rice has been cooked, add carrots to it. Put raisin and elaichi in this mixture. Keep stirring it frequently, so that it does not stick to the bottom of the pot. 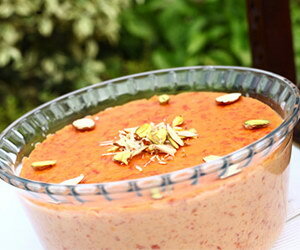 When carrots become soft and milk dries out, add sugar and half of the almonds. Cook it on low flame and keep stirring. Once it is ready, garnish it with almonds and pistachio.